Garlic is an easy-to-grow root crop for the home garden. Cloves are planted in fall for a summer harvest, with the largest cloves from each harvest set aside for replanting as seed garlic. There is usually a few months between the summer harvest and fall planting, so the cloves must be stored properly until planting time. The smaller cloves are stored the same way for use later in the kitchen. While the seed cloves only need stored for a few months, the cloves for kitchen use my need stored for six months or more. Spread the garlic bulbs out on newspaper in a warm, dry room. Choose an area away from direct light during drying. Dry the bulbs for three weeks. Cut off the yellow foliage from the top of each bulb with a sharp knife. Leave only 1 inch of the leaves attached to each bulb. Separate the larger bulbs out for planting and inspect all the bulbs for signs of damage or soft spots. Dispose of the bulbs that are damaged or place them in the refrigerator and use within two to three days. Place the garlic bulbs into mesh bags. Label each bag with the type of garlic, date stored and whether you are setting it aside for seed garlic or for cooking. Save the larger cloves for seed, as these produce the largest bulbs. Hang the bags in a dry place at 32 to 40 degree F. A basement, unheated enclosed porch or garage offers storage options. 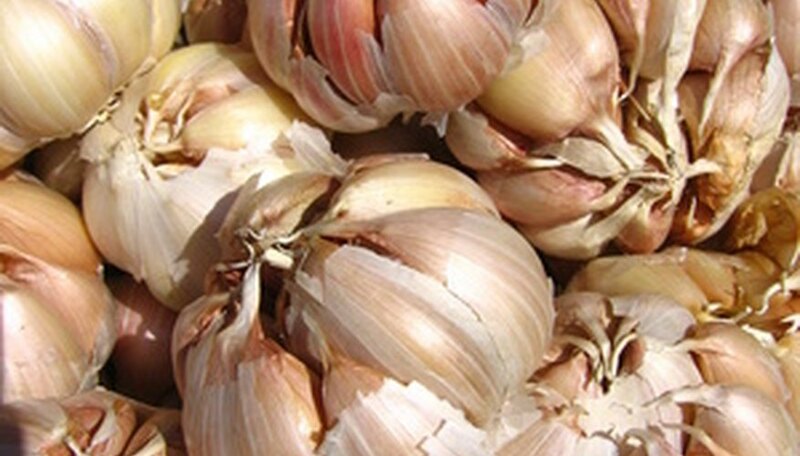 Hardneck garlic, such as Rocambole, stores for up to three months. Softneck garlic and elephant garlic, which are more commonly planted in home gardens, store for up to six months. Hang the garlic in an area where pests cannot bother it. Hooks in ceiling joists in the basement keep the garlic away from walls and prevent pest access.